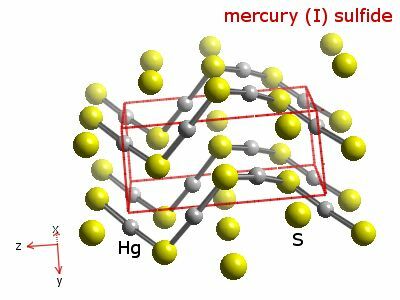 The oxidation number of mercury in mercury sulphide is 2. Red mercury(II) sulphide (cinnabar or vermilion, density 7500 kg m-3) can be made by the reaction of mercury(II) acetate, Hg(O2CMe)2, with hydrogen sulphide in the presence of exces ammonium thiocyanate, NH4NCS. Mercury(II) chloride can be used in place of the acetate but the colour of the product is siad to be less brilliant. The yield is nearly quantitative. The table shows element percentages for HgS (mercury sulphide). The chart below shows the calculated isotope pattern for the formula HgS with the most intense ion set to 100%.